If you have found your way onto a yoga mat for any length of time, then you know that yoga is sneaky. What starts maybe as a desire to gain flexibility, learn to relax, or get the infamous yoga arms can quickly become much more. With consistent yoga practice, all types of yoga will take you into places in your soma and psyche that you have likely never journeyed. And tucked away, deep inside our bodies are some of the most intensive experiences we’ve ever had, the ones so intense, in fact, that we’ve never actually been able to experience them fully, much less integrate them. I started teaching yoga in the 90s, and briefly lived in a yoga ashram. This was a time before yoga was popular and found on every street corner. For better and for worse, yoga teachers and students lived close to their gurus. This brought a certain accountability and grounding to the practice. Still in those early days of practice, the ways in which my fellow yogis and I were unraveling alarmed me. I stopped practicing and teaching yoga for a long time. Determined to understand what was happening to people’s lives as a result of yoga practice, I went to graduate school to study Transpersonal Psychology. I became a therapist and then picked my yoga practice and teaching back up with new eyes, and new tools. Like any genuine spiritual path, yoga takes us to the places where we find our biggest contractions and blind spots, and shows them to us even sometimes when we’re not quite ready or equip to see. What tools are we giving our students to navigate their breakdowns? Are we making space to discuss with our students the various dimensions of yoga practice? What is our responsibility to know our limitations as teachers and provide our students with adequate resources for supporting their practice? How do we recognize when we have pushed our students past their self-capacity? 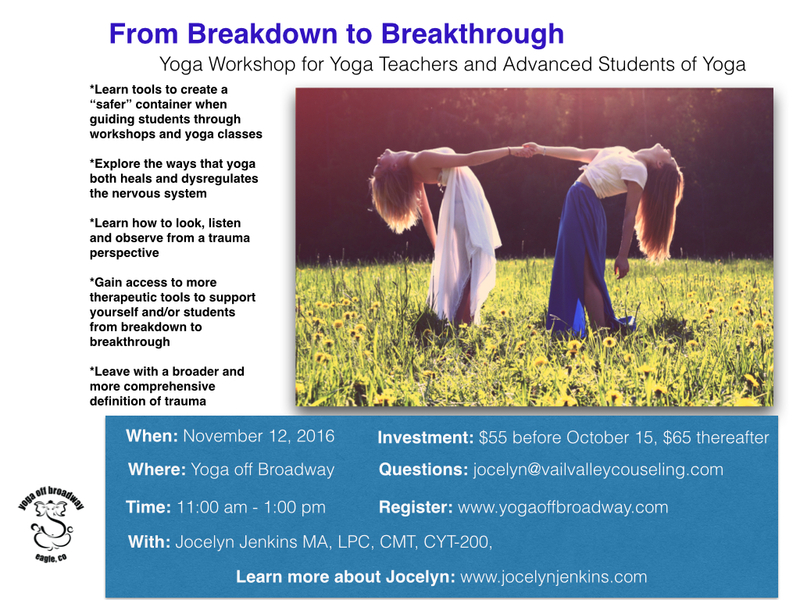 What do we do when a student (or when we) encounter a major, unresolved trauma through increased body awareness or prana? And even beyond overt trauma — tears and collapses — we have an obligation to notice when a student is coming to more than one yoga class a day and growing thinner and thinner … and thinner as she practices harder and harder. It’s time we be willing to notice the student who regularly stumbles out of our local bar, or is looking hollowed out and frightened. We are on the front lines of life for many of our students, and yet most yoga training is woefully inadequate to address the thornier and realer experiences that we’re likely to encounter out here, in the real world. The experiences that are shared day in and day out, in my psychotherapy practice. There are some simple tools you can learn to become a more aware, impactful, compassionate, and fiercely supportive teacher to your students, in the many seasons of their lives. Our bodies not only don’t lie, they can’t lie. Learn to see the truth coming out of them, and how to be a strong supporter for those students brave enough to face themselves on the mat each week. My background in yoga, psychology, trauma, and healing means I can help you to better help your own students. I’ve been there, on both sides of this, and am here as a support. Join me to learn more. Jocelyn’s passion to learn more about the mind-body connection lead her to certifications in massage therapy, energy healing, yoga therapy, completion of 2 yoga teacher training programs, and over 3,000 hours in training, supervision and clinical work with distinguished physicians and researchers in the field of trauma and neurobiology. She has a Master’s Degree in Transpersonal Psychology, with additional emphasis in Somatic Psychology, from Naropa University.